The fate of the world hangs by a thread. Samual Haight, archenemy of Garou and Verbena, has learned a secret that could trigger the End. Meanwhile, San Francisco teeters on destruction. Only a gifted girl can save it, and the Maurauders and Technocracy both want her. Can the mages save us all? 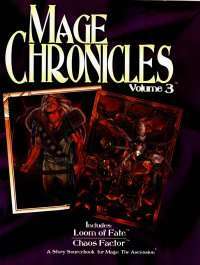 Mage Chronicles Volume 3 features Loom of Fate and The Chaos Factor, two of the earliest sourcebooks released for Mage: The Ascension that have long been out of print. Now they're back under an all-new cover.